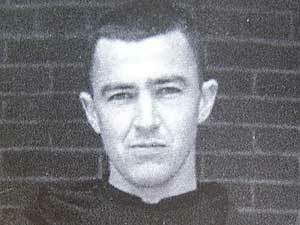 St. John's University in Collegeville is remembering the late Sen. Eugene McCarthy. McCarthy, who died in December 2005, graduated from St. John's University in 1935 and taught there in the 1940s, before moving on to a career in politics. McCarthy's friends and family say they knew the man as a student, teacher, poet and statesman. Collegeville, Minn. — The spacious yet spartan concrete Abbey at St. John's echoed with the voices of monks singing the Mass of the dead. The Monday evening service was held to honor and celebrate the life of Sen. Eugene McCarthy, who died in December at the age of 89. McCarthy was born in the central Minnesota town of Watkins, not far from here, in 1916. He attended St. John's prep school, and then graduated from St. John's University with highest honors. He taught at public high schools in Minnesota and North Dakota in the 1930s. He then came back to St. John's to teach economics and education in the 1940s. The lanky, athletic McCarthy also coached baseball and hockey. Former St. John's University President Hilary Thimmesh said most people don't realize that's when McCarthy entered the monastery, spending almost a year pondering life as a Catholic monk. "In the end he decided to direct his search for God toward marriage, family, teaching and dedicated public service, without rejecting the high ideals instilled in the novitiate; the quest for God, for peace, for justice," Thimmesh said. After leaving St. John's, McCarthy joined the Army and became a codebreaker for the War Department. He taught again in Minnesota after World War II at the University of St. Thomas in St. Paul. In 1949 McCarthy entered politics, successfully winning a Democratic seat in the House of Representatives, where he served for a decade. When McCarthy was elected to the U.S. Senate in 1958, Walter Mondale said people knew he wasn't just an average lawmaker. Former Vice President Mondale said McCarthy was witty, intelligent, and elegant. "If you wanted to paint an ideal picture of what you wanted a senator to look like, and you were a genius, you would come up with something that looked like Eugene McCarthy," Mondale said. Many thought McCarthy looked like presidential material, and in 1968 he challenged President Lyndon Johnson for the Democratic nomination. McCarthy's strong primary showing in New Hampshire led to Johnson's withdrawal from the race. McCarthy would later lose the nomination to Hubert Humphrey. Mondale said the nation should remember McCarthy for his strong stance on social and civil rights, and his opposition to the Vietnam War. "What Gene did in his time, his challenge to power, his call to a new generation of leadership, is as much needed now as it was then. I hope we will honor his memory by following his example of conscience and courage, to end wrong and restore the civic renewal we need so today," Mondale said. McCarthy's son Michael also spoke at the memorial. He knows his father will be remembered for a life in politics. "But I really think he'd want to be remembered for his poetry. In fact, dad says the reason he ran for president was to get his poetry published," McCarthy said. Instead of talking about politics, Michael McCarthy chose to read several of his father's poems to the audience. McCarthy said it was that side of his father that made him seem so unique to the nation. "Dad was often somewhat of a mystery to people because he was a politician that quoted poetry and philosophy. I think maybe one of the secrets, or the real reason he seemed different, was he was a poet who serendipitously had wandered into public life," McCarthy said. There's another memorial to honor McCarthy Tuesday evening at the University of St. Thomas in St. Paul. McCarthy's daughter Ellen is among the people scheduled to offer a eulogy.